Templates to print Yin Yang shapes on fabric or paper. Print hundreds of curved shapes on fabric (or on paper for templates) in a few minutes and start sewing! Print shapes on fabric with any ordinary Inkjet printer. This Inklingo PDF includes one shape, one size. FUSSY CUT YIN YANG WITH INKLINGO! Start by printing a window template on scrap paper with Inklingo. Then position the freezer paper to print identical shapes with Inklingo. There is more about fussy cutting on the All About Inklingo blog. 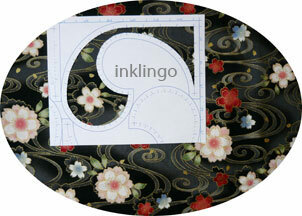 Any Yin Yang pattern is easier to sew with Inklingo! This setting also uses Inklingo Circles! Mirror image blocks create another special effect. The shapes are laid out to use fabric efficiently. Use a rotary cutter or scissors. Just print, cut, and sew! This is an impressive, unusual design that you rarely see in a quilt show. This size can be used with other 6 inch blocks. 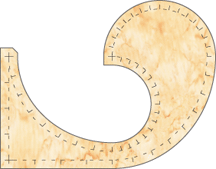 Can you imagine cutting and sewing this shape without Inklingo? Printing fine lines on the fabric with Inklingo makes cutting and stitching easier, faster, and more precise than ever before. There are more images of Yin Yang quilts on Pinterest. IMPORTANT NOTE If you are new to Inklingo, I recommend starting with the FREE Diamond Triangle Square shape collection. It includes the first chapter of The Inklingo Handbook. With that and the Top Ten Tutes on the blog, you will be an expert in no time!